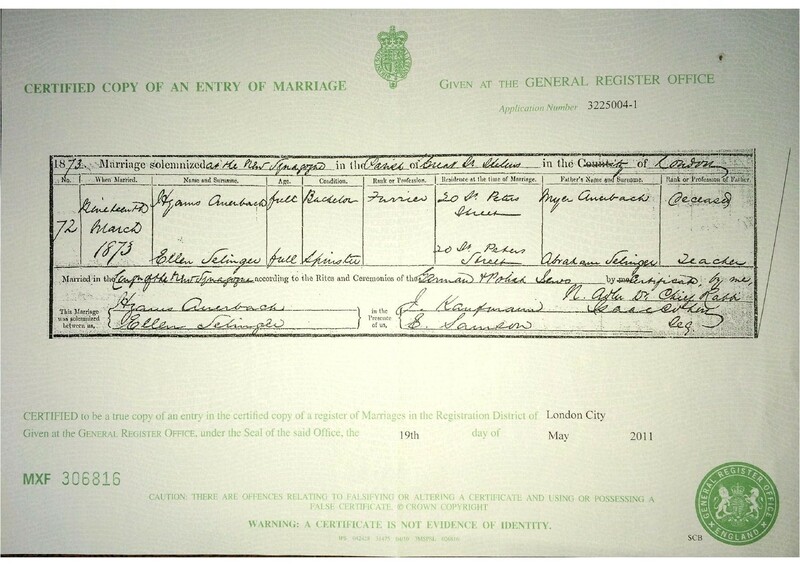 Did Eleanor Selinger Marry an English Cousin? And Did She Remember Her American Roots? In my post about the children of Julius and Augusta Selinger, I wrote about the marriage of their daughter Eleanor to an Englishman, Henry Abbot. Henry Abbot was the son of Hyams Auerbach (some members of the family changed the name to Abbot at some point) and Helen (or Ellen or Helena) Selinger. 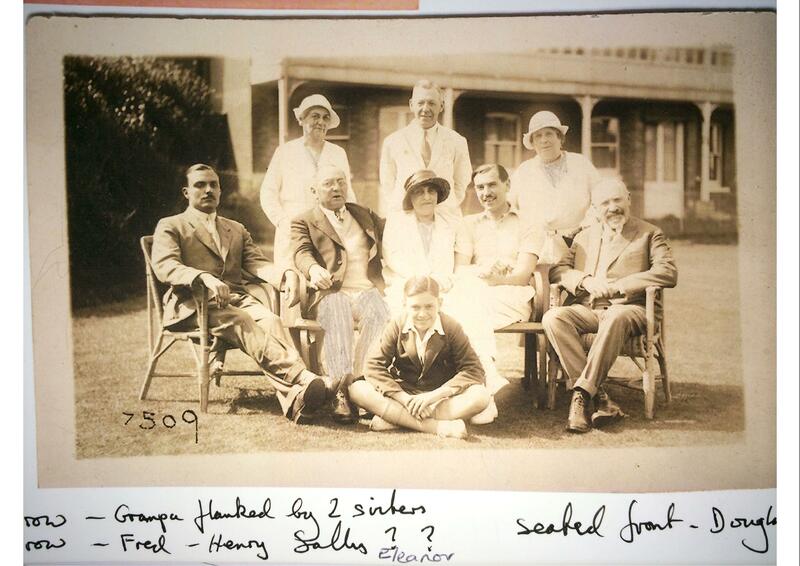 I had wondered whether there was any familial connection between Helen Selinger and Eleanor’s father, Julius Selinger. Both were born in Germany, and they were three years apart in age: Helen was born in 1850, Julius in 1853. 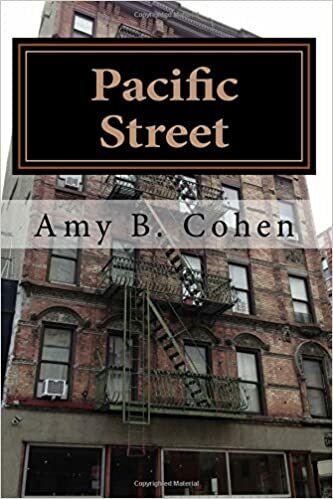 As I wrote then, I was in touch with one of Henry and Eleanor Abbot’s relatives on the Abbot side, Henry’s great-niece, Valentine Ann Abbot Collinson, and was hoping that she would be able to provide some clues to determine whether the two different Selingers were related. Over the last several days I received a number of documents about Helen Selinger and her family from Val that could help answer that question, including this photograph. Val believes that the woman seated in the center of the photograph is Eleanor Selinger Abbot with her husband Henry seated to her right. The others are other members of the Abbot/Auerbach family. The oldest document is the English marriage certificate of Hyams Auerbach and Ellen Selinger, dated March 19, 1873. According to the certificate, Hyams was a furrier whose father was deceased, and Ellen was the daughter of Abraham Selinger, a teacher. Since Julius Selinger’s passport application indicated that his father’s name was Sigmund, I knew that Julius and Ellen/Helena did not have the same father. But could they still be cousins? I do not know Alfred or Frederick Selinger’s fathers’ names, so it still seemed possible that there was some familial connection among the various Selingers. 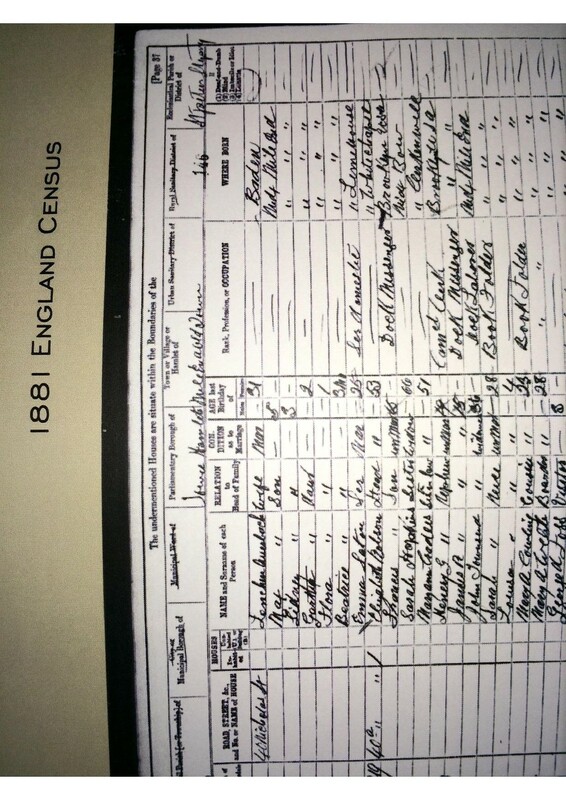 The next document was the 1881 English census for the Auerbach family. This is definitely the right family; the page preceding this one includes as its last entry Hyams Auerbach, the furrier. His wife’s name was given as Lenchen, which is the German equivalent of Helen. Her place of birth was reported to be Baden. This was the second clue that there might not be any familial relationship between Helen Selinger and Julius Selinger. Julius and Frederick Selinger were both from Hurben in the region of Bavaria, not from Baden, an entirely separate region of what became united Germany in the late 19th century, although perhaps no more than a few hours away. I then checked JewishGen.org and found that Selinger was not an uncommon name for Jews in Germany, especially if other spelling variations were included. This makes it harder to assume any family connection between the DC Selingers and Helen Selinger. I do have the names of two other members of Helen’s family; in addition to her father Abraham, her mother’s name was Gali. She died in 1899, and her son, Helen’s brother, Sidney Selinger, was with her at her death. If I can find a way to research the family in Baden, I might find a possible link to the Hurben Selingers, though it seems unlikely. Perhaps the most intriguing document that I received from Val was an account of the distribution of the estate of Eleanor Selinger Abbot. Eleanor died in 1979, and her will was probated on January 23, 1980. The executor’s report on the distribution of the estate listed seven named beneficiaries, including two whose names were familiar: Marjorie Christian and Ellen Kleinfeld. Who were Marjorie Christian and Ellen Kleinfeld? They were born Marjorie and Ellen Rosenstock, daughters of Felix Rosenstock and Marjorie Greenberg. Marjorie Greenberg was the daughter of Jacob Greenberg and Ella Cohen. Ella Cohen was the daughter of Moses, Jr., and Henrietta Cohen. She died at age 29, leaving behind her eight year old daughter Marjorie and her husband Jacob. 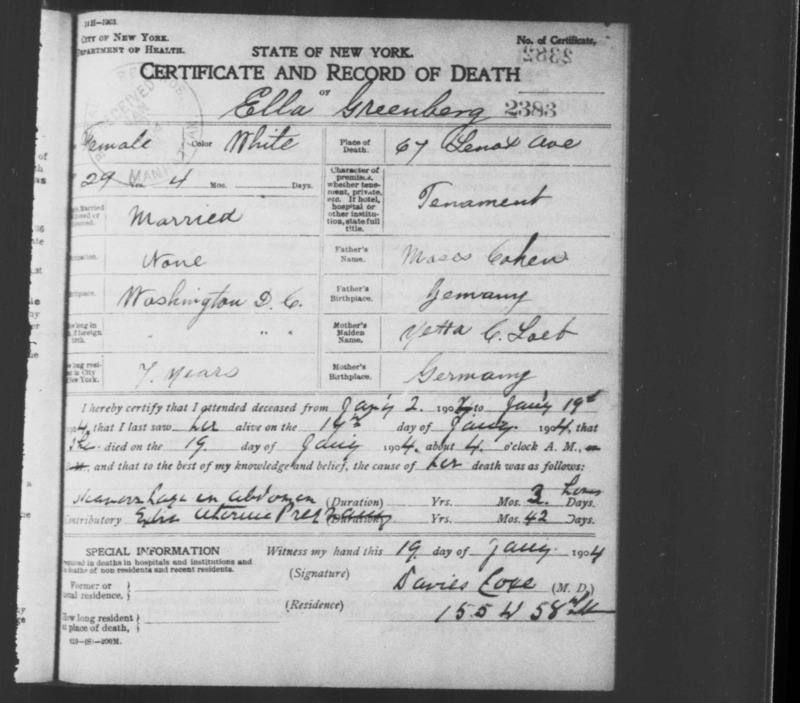 (Ellen Rosenstock Kleinfield was named in memory of her grandmother Ella.) 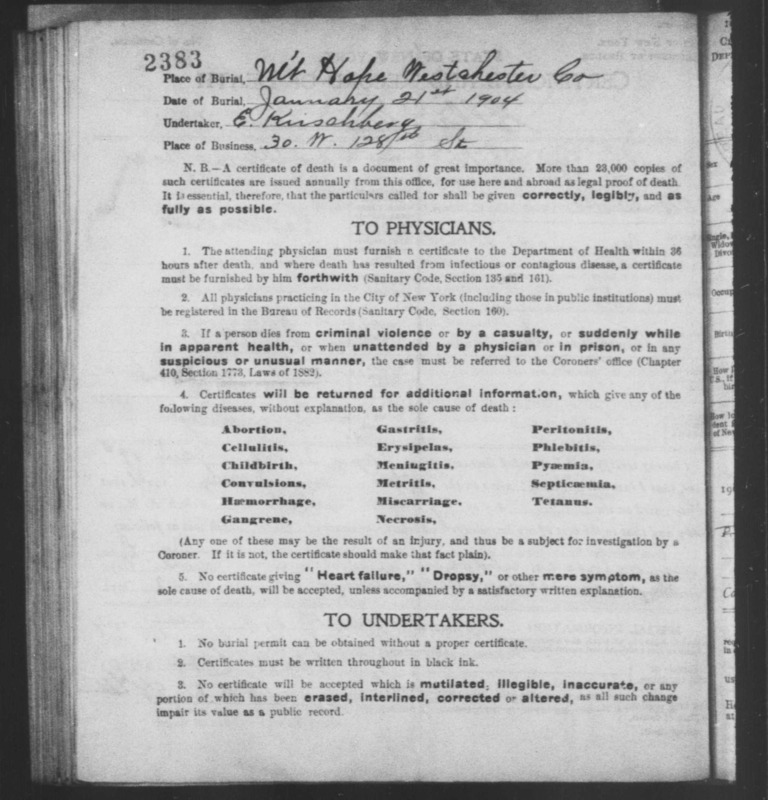 I have just received Ella’s death certificate, and it says that she died from an abdominal hemorrhage caused by an “extra uterus pregnancy,” which is what we would now call an ectopic pregnancy. How tragic it must have been for Marjorie and her father Jacob to lose Ella in such an awful way. As I wrote earlier, Jacob remarried a few years after Ella died and had a son Theodore with his new wife Hattie. Since Jacob lived in New York, I had wondered whether he and Marjorie had maintained much contact with Ella’s family after Ella died. Well, Eleanor’s will would certainly indicate that there was a continuing relationship. Eleanor, who never had children of her own, left part of her estate to her Aunt Ella’s granddaughters. Her first cousin Marjorie Greenberg Rosenstock had died in 1964, but obviously despite living in England since 1926, Eleanor had enough of a relationship with her American family and in particular with her cousin Marjorie Greenberg to leave part of her estate to Marjorie’s daughters. Marjorie Rosenstock Christian died on July 18, 2013. According to her obituary as published on July 24, 2013 in the Washington Post, she graduated Phi Beta Kappa in math and chemistry from Hunter College and then earned her Master’s degree in chemistry from the University of Maryland. (See more at: http://search.ancestry.com/search/obit/viewbody.aspx?db=web-obituary&pid=219473182&kw=Rosenstock+Christian+Marjorie&cpp=2013%5c07%5c26%5ccp_12269788.html&bhr=http%3a%2f%2fwww.legacy.com%2fobituaries%2fwashingtonpost%2fobituary.aspx%3fn%3dmarjorie-christian%26pid%3d166008840#sthash.E4eCxeTg.dpuf .) She was married to Jack Christian, who died in 2011, and had three children. I was very fortunate to speak with her sister Ellen Rosenstock Kleinfeld, my fourth cousin, who told me that she remembers Eleanor Selinger Abbot well and that Eleanor had visited with her family many times over the years, including one trip to Long Island during a hurricane after Ellen was married and had children. Unfortunately, I did not learn any more about how Eleanor met Henry or whether the various Selingers were related. Ellen was married to Herman Kleinfeld and had two children. Thus, from one thread in one family I found a link to another part of the family, tying together the lives of Ella Cohen and her descendants with the life of her niece Eleanor, the daughter of Augusta Cohen Selinger. Eleanor may not have married a cousin, but she kept her ties to her American cousins. She also brought the Cohen family back to its prior home in London. This entry was posted in Cohen, DC, England, Genealogy and tagged Bavaria, Cohen, England, Family, genealogy, Germany, Washington DC by Amy. Bookmark the permalink. Wow, that’s intriguing. I’ve been trying to find a connection between Helena Selinger and my Selinger cousins also. I will email you!